Dr. Thomas Conlan is an Associate Professor of History and Asian Studies at Bowdoin College. He received a BA in History and Japanese at the University of Michigan in 1986, a PhD in History from Stanford in 1998, and attended Kyoto University from 1995 to 1997 on a PhD Program. 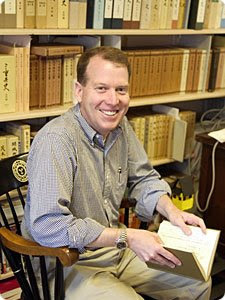 Dr. Conlan has written the groundbreaking books "In Little Need of Divine Intervention", "State of War", and "Weapons & Fighting Techniques of the Samurai Warrior AD 1200-1877". In addition, he has written articles on Japanese history (as well as done book reviews) for many notable works as the Harvard Journal Of Asiatic Studies, Monumenta Nipponica, and The Origins of Japan's Medieval World. He's also appeared as a guest expert on History Channel specials involving samurai, as well as helping put together acclaimed websites featuring in-depth examinations of two important Japanese documents/works of art-the Mongol Invasion Scrolls and the Heiji Disturbance scroll. Dr. Conlan was kind enough to take time from his busy schedule to speak to the Samurai Archives, and we think you'll find what he has to say to be as thought provoking as his books. Thanks to forum members Dash and JLBadgley for submitting questions, and Obenjo, Kitsuno, and Ashigaru for their input. SA: Where did your interest in Japanese history first begin, and why is it that you've chosen to dedicate your career to this pursuit? What period are you most personally fond of, and why? TC: I first remember reading a book about the samurai when I was in junior high school (one of Turnbull's books). That first got me interested in Japan, and while I was attending Harvard Summer School, I decided to devote my life to studying Japan. Sounds corny, but it is true. As a sign of my promise, I used all of the money I had saved that summer to buy an ivory netsuke of a man carrying a monkey in a sack. (I still have that netsuke). I feel fortunate that I have been able to learn under so many great professors at the University of Michigan and Stanford, for they have helped me along this career. I don't have a good reason for why I have dedicated my career to this save that I continue to find Japanese history interesting. I love the fourteenth century, for the sources are unparalleled, and there is a refreshing honesty to the documents. The precision of the documents also amazes me. When I first read a battle report describing wounds, and saw notations by a battle administrator describing them as "deep" and "shallow." I knew that through such records, I could reconstruct how men were wounded, and thereupon understand how wars were fought in the fourteenth century. It was a September day in 1992 that I knew that I would write about the wars of the fourteenth century for my Ph.D. dissertation (this became State of War). 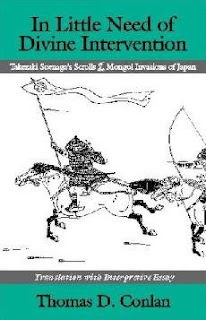 SA: “In Little Need of Divine Intervention” was your first book and brought new insights to the Mongol Invasions of 1274 and 1281, using the reward petition scrolls (Moko Shurai Ekotoba, commonly known as the ‘Mongol Invasion Scrolls’) of Takezaki Suenaga as its focus. This was fascinating both for its examination of what the scrolls tell us about the invasions as well as the history, changes, and variant copies made of the scrolls themselves. How was the central point of the book (that the ‘kamikaze’ was only the exclamation point on a set of failed invasions rather than the major cause of them) received both in the west and Japan? Did the lack of access to the original scrolls (held by the Imperial Household Agency) cause any difficulties in your research? TC: I often think of In Little Need as my second book, as I wrote it after I had completed State of War. It came out of my classes at Bowdoin, for as I was teaching a freshman seminar at Bowdoin on the "Wars of the Samurai" in the fall of 1998. I was amazed that the Suenaga account had not been translated, so I set about doing it. I was able to view many of the copies of the scrolls while in Japan (2000), and also visit Suenaga's lands and the walls where the Japanese defeated the Mongols in Northern Kyushu. I also had the opportunity to view the important scenes of the original, which is held by the Imperial Household Agency, during a museum exhibit. At that time, I saw two scenes from the originals--1) where Suenaga is being shot off his horse, with the exploding 'teppo' nearby, and 2) where Suenaga, with his ersatz shin-guard helmet falling off his head, is decapitating an enemy sailor. And such excellent photographs exist of the originals from recent exhibits that it is possible to view the scrolls pretty well. I have been happy with the reception that my book has received. Japanese archaeologists at Takashima, who are excavating the remains of the Mongol fleet, had agreed with my assertion that the Mongol fleet was of a relatively small size; and also my revision of the invasions have influenced the narratives of books in fields outside of the discipline of history. Richard Bowring's The Religious Traditions of Japan (Cambridge 2005), for example, accepts my characterization of the invasions, which is gratifying. Reflecting on the reception, I was surprised that the sources pertaining to the invasions have not been more rigorously analyzed, or that these scrolls were not translated earlier. SA: In conjunction with the book, a website was put together that allowed viewers to browse and compare side-by-side the different versions of the scrolls, noting the changes and additions made to each version along with other features of note. Later, a similar website was created for the Heiji Disturbance Scroll (chronicling the Heiji No Ran of 1159). This gave readers the chance to see rather than just read about the important features of these documents/works of art, and is a fine example of how the rapidly developing electronic technology field has aided the study of history. Do you believe that the computer age and the attendant ease of procuring copies of source documents has been one of the major driving factors behind the excellent work, new theories, and other advancements in Japanese history made in the last ten years? TC: I do not know if changes in scholarship were caused by the new technology, but certainly this new technology enables some obscure sources to be better appreciated. We remain in the early stages of appreciating all that can be done on the web. I believe that the web allows for scrolls and other sources that are not reproduced in a book format to be viewed in a manner approximating the experience of seeing the original. The Mongol scrolls website grew out of a need to scan images for publication in In Little Need of Divine Intervention. It was Peter Schilling, of Bowdoin, who first suggested that we build a site to see the scrolls. It took us several years to do, but fortunately, technology improved, and computers could handle larger images more easily. The Heiji scrolls represent our latest reproduction of the scrolls. I graciously received digital images from the MFA and Kevin Travers designed this excellent site. SA: “State Of War” centered around the warriors of the 14th century (notable for the destruction of the Hojo regents/Kamakura Bakufu, the Kenmu Restoration, and the subsequent Nanbokucho wars) and how they conducted the art of war. Period accounts and war tales (‘monogatari’) are used to build a model of battle that seemed to be mostly skirmishes where the majority of injuries (around 75%) were received from projectiles (the majority of these being arrows in this time frame). Massed cavalry charges or dense infantry formations were rarely seen. Given the unreliability of many accounts, letters, quasi-official documents like the Azuma Kagami, and monogatari (ranging from ridiculously high estimates of troop strengths to the discounting of the role of lower status warriors), how difficult was it to separate fact from fiction to arrive at a workable model? TC: It is best to use documents, literary sources, geography and archaeology in tandem to get a sense of a past age. Literary sources can be very illuminating. They just must be used with care and treated with skepticism.I find that literary sources are most useful in their details as to how certain weapons are used, and least useful in their characterizations of specific individuals (who can be easily idealized or demonized), or, for that matter, for their estimates of the size of armies. . People are very poor at estimating the size of large groups. Most accounts overestimate the size of armies by a factor of at least 10. Chronicles such as the Taiheiki use numbers as metaphors and there is no clear consistency. At the same time, a careful read can prove illuminating. Accounts of the Jokyu War provide fantastically large estimates of troops (over 180,000) but at times, refer (more accurately) to armies consisting of hundreds or 1,800 men, which strikes me as plausible. A fictional account can be used as a historical source. A novel for example, could provide insight into what it was like to ride a bus for someone who knew nothing about them; the same can be the case for details about weapons usage in medieval texts. Exploration of textual variants can prove insightful. I have discovered a roster of the names of the Kamakura warriors who were wounded, killed, or who captured or killed enemies in 1221. This roster (which has not been translated) proves very insightful, and could very well be a copy of an actual list provided to Kamakura after the 1221 conflict. So it is important when studying an age to be aware of all sources; the more primary documents one reads, the better it is to deeply understand an age. SA: One of the more interesting sections of “State Of War” is the chapter “Sacred War”, which among other things examines the influence of Buddhism, Shinto, and superstition on the warriors of the 14th century (both in a military and political sense). Was the financial, military, and administrative support given by gokenin and samurai to temples and shrines (and vice versa) born out of true belief, or was it largely political expediency? TC: I am glad that this chapter is of interest. It is one of my favorite ones in the book, and has become the basis for my next monograph. We cannot know the actual motives of anyone, but all actions seem to suggest that warriors and courtiers believed that various prayers and maledictions determined victory in military endeavors. My most recent research explores how Shingon priests proved to be the most politically powerful men of the fourteenth century. They were responsible for the fighting to continue, and they first enforced the notion that warriors should be loyal to their 'lord'. 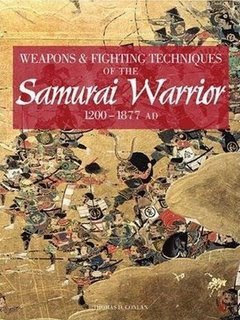 SA: Your newest book, “Weapons & Fighting Techniques of the Samurai Warrior 1200-1877” is a lavishly illustrated volume that seems to be aimed at a general readership. How was the experience of writing this book different from your first two? TC: The short deadlines differed greatly from my previous research, where I could pretty much work at my pace. I received much help in securing permission for photos, and also was able to work with a team of illustrators, so the book came out quite quickly, and not several years as I was used to. I found it hardest to not be able to include footnotes. I compensated wherever possible by mentioning the name of the sources that I used in the narrative. I think it is important to provide information that can be verfied. I included all my sources in the bibliography, but I would prefer having footnotes. SA: The new book also does to the battle of Nagashino what ‘Divine Intervention’ did to the Mongol Invasions-reappraising the course of the battle using not only primary documentation but also period painted screens, recent excavations, and a survey of the battlefield terrain. What led you to discount the embellished Edo period accounts of the battle and present such a dramatically changed version? Did you find the extremely small number (nine to date) of bullets recovered from the site of the battlefield surprising? TC: In 2005, I had the opportunity to walk the Nagashino battlefield and in doing so, and seeing where bullets had been discovered, I realized that common characterizations of the battle were wrong. As a result of this visit, I explored sources about the battle, which have conveniently been published in a volume of the Aichi kenshi (prefectural history of Aichi). This compendium of sources contains all surviving accounts and documents pertaining to the battle, and also reproduces the oldest surviving screens depicting the battles (unfortunately I could not get an image of this reproduced in "Weapons and Fighting Techniques.") My Nagashino narrative represents my first foray into reconstructing this battle; I may do a more extended account in the future. I find it best to treat Edo accounts and narratives with skepticism, because they tended to be ahistorial thinkers who projected the ideals and assumptions of their age onto a very different Japanese past. Takeda Katsuyori was not so stupid as he appears in the film Kagemusha. He attempted to encircle the Tokugawa forces opposing him and was tricked into doing so by a Tokugawa commander opposing him. Trickery accounted for the decisive nature of the encounter more than guns per se. The small number of bullets does not surprise me, as this area was intensively tilled in the Tokugawa era, and the bullets, if discovered by peasants, were probably melted down for their metal. In addition, I believe the number of gunners was less than has commonly assumed--perhaps only 1000 or so. SA: Much of what is accepted as truth regarding pre-modern Japanese battles (both in English and in popular Japanese publications such as Rekishi Gunzou) comes from the histories of these events written in the 1890’s by the Japanese General Staff ("Nihon Senshi"). These works were written with the agenda of giving Japan an impressive documented military history to present to western eyes. Recent evidence indicates that battles promoted in these histories as major events were in fact rather minor actions. Using Tedorigawa (1577) as an example, it is written up as a major set piece battle involving tens of thousands of troops. However, the scant real evidence on it shows a minor rear guard action involving a small skirmish between a thousand or so troops. With this in mind, how reliable should these volumes (and many other earlier Edo period histories) be considered? TC: I do not consider them to be very reliable. Far better to critically analyze surviving primary sources. OK to read these sources and use them as a guide to surviving sources, but best not to let them cloud your understanding of the past. SA: One of the common threads running through your works is stripping the veneer from samurai warfare. Rather than being shining paragons of honorable behavior, samurai are shown (in their own documents and words) to be rather self serving and ruthless. Running from battle, abandoning comrades, switching sides, striking from ambush, setting fires, and looting are the norms rather than the exceptions. Bushido was an idealized version of samurai behavior that as you have pointed out was largely a fallacy and surely not followed as a general ‘code of conduct’ throughout Japanese history. While this question might be more appropriate for a behavioral psychologist, why do you believe the concept of ‘bushido’ exerts such a strong pull on so many self-styled ‘Modern Samurai’? Why in particular bushido, when other outdated warrior codes from other cultures have been left behind in the pages of history? TC: I characterize what I do as essentially humanizing the samurai and showing that they could be brave, cowardly, or self-serving. One sees the whole range of behavior in their actions. War was in a strange sort of way a very human event and those who fought and survived had to maintain a healthy dose of pragmatism. Bushido represents an ideal--a remarkable cultural formulation--that is very much alive today. The reason for this stems not from Tokugawa thinkers, who tried to formulate a justification for warriors to exist in a time of peace, but the work of Nitobe Inazo. Nitobe defined Bushido in such as way as to make it understandable in European/American context. Thanks to Nitobe, Bushido became a component of Western cultural consciousness. Bushido represents a moral code not tied to any religion--Chivalry without Christianity-- which accounts for its appeal, I believe. SA: What are the biggest challenges you face in producing something? Is it the research, the writing, or the actual act of publishing? TC: Finding the time to research, write and revise a project. SA: Many acquire an interest in Japanese history through the avenues of anime, manga, martial arts, video games, and Japanese films. Do you see such sources of ‘pop culture’ history as an opportunity to foster a serious interest in Japanese studies, or a hurdle to be overcome? TC: By all means, they are a good avenue into study; I think that they represent a good gateway into more serious study. If you intend to engage in serious study, then learn Japanese. SA: What advice do you have for students of Japanese history? For those who wish to pursue a career in the field, what universities would you recommend? TC: It is important to come from the universities with the best reputation--Princeton, Stanford, Harvard, Berkeley, University of Michigan, Columbia. Many institutions are strong in modern Japanese history, but for premodern instruction, there are fewer specialists. Joan Piggott at USC, Hitomi Tonomura at Michigan, and Andrew Goble at Oregon are great scholars taking on graduate students. SA: Whose work among the current crop of historians impresses you the most? What other books would you recommend to our board members, either in English or Japanese? TC: I could write a long list but for historians that come to mind right now, I like Dani Botsman's work on crime and punishment in Tokugawa Japan, the writings of Karen Wigen of Stanford, Mark Ravina's work on Saigo Takamori and local lordship in Tokugawa Japan, and Karl Friday's recent work on Taira Masakado. SA: Your faculty listing on Bowdoin University’s website lists several articles and projects you are currently working on. What other works might you have in progress you can tell us about? TC: In addition to those articles, I have completed an account of Medieval Japanese Warfare, 1200-1550, which will be published in the Cambridge History of War, a new multivolume series that I think readers of the forum will be interested in. This will not come out for a few years. I also continue working on my next monograph, about the political importance of Shingon, and how Shingon Buddhists of the fourteenth century were able to create emperors and the symbols of office, and enforce the notion of loyalty to a lord. I am polishing my manuscript, called From Sovereign to Symbol: Regalia, Ritual and the Struggle for Secrecy in Fourteenth Century Japan. SA: We'll be looking forward to those! Thank you, Dr. Conlan, for an informative and entertaining interview-it's been a pleasure. Good interview. Very informative. I am interested to read about the Shingon Buddhists.